Ketchup is an irreplaceable condiment for making chicken rice and neapolitan pasta. Compared to tomato paste and tomato sauce, ketchup is sweeter and the preferred condiment for adding tomato taste to any dish. 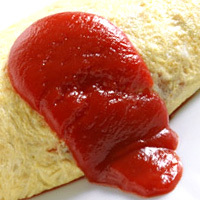 In Japan ketchup is used to make a rice dish contain eggs called omelet-rice. In this case ketchup is added last applying the finishing touches. The calories in Ketchup per 15g(1tbsp) is 18 calories. Ketchup is calculated to be 119Cal per 100 grams making 80Cal equivalent to 67.23g with 4.11g of mostly carbohydrates、0.26g of protein、0g of fat in 15g while being rich in vitamins and minerals such as Molybdenum and Sodium.